Accurate shots at all ranges. Reloaders offers shooters a fast, accurate way to get shots on target with their Leatherwood scope range. Firstly, a bit of history, the ART Automatic Ranging and Trajectory scope, which is still in use by the US army today had its beginnings in the Vietnam war. All long range shooters know that they have to adjust height with their ¼ MOA turrets to compensate for bullet trajectory. This involves many, many clicks, all of which have to be counted then some math done as they are often ¼ MOA. By the time all this fuss is over the game animal has run away. Speed is what you need in the field with target trajectory compensation. Speed with on target trajectory compensation is the essence of what makes this Leatherwood Scope great. It is all in the scope set up on the range. Get that right – and you only need to do it once – and then your shooting is on target at any distance. In Vietnam, Lieutenant James Leatherwood figured out this system. It works by combining a variable power zoom ring locked to a caliber-specific cam and hinged base. 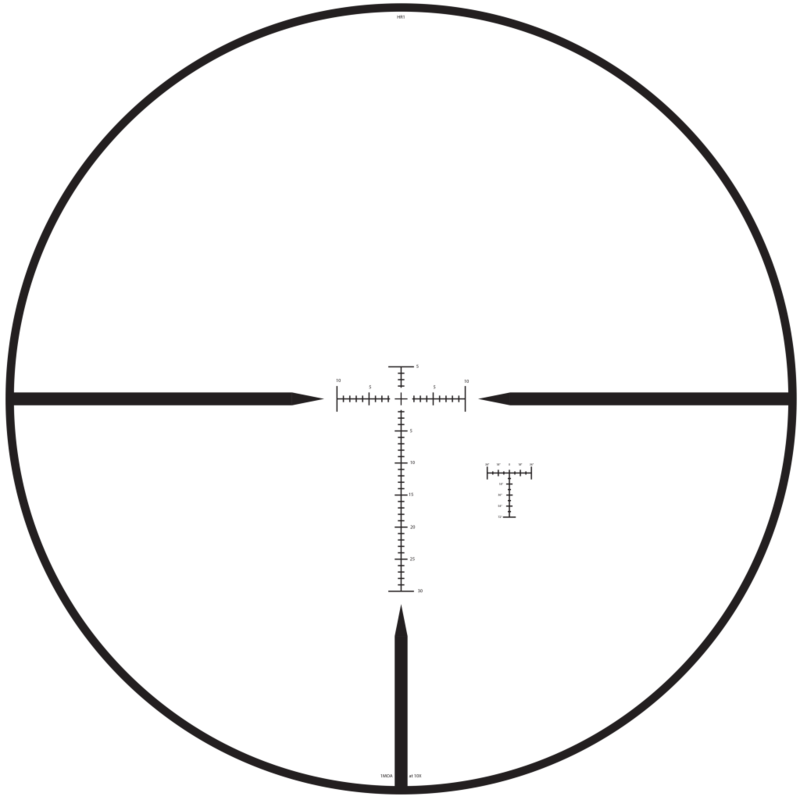 In addition to a standard Mil Dot reticle, there is a rectangular bracket representing 1 meter (with 18-inch subtends- this is the width of a deer chest) surrounding the crosshair. The power ring and adjustable cam are synced to the scope base — which raises and lowers the scope, compensating for bullet drop. All the shooter has to do is place the reticle on the target, zoom the scope in to FRAME the target with the bracket on the scope reticle (this is the 18″ height of a deer chest), AIM, and squeeze the trigger to SHOOT. In about 5 seconds you have the scope adjusted for trajectory of the bullet at any range! 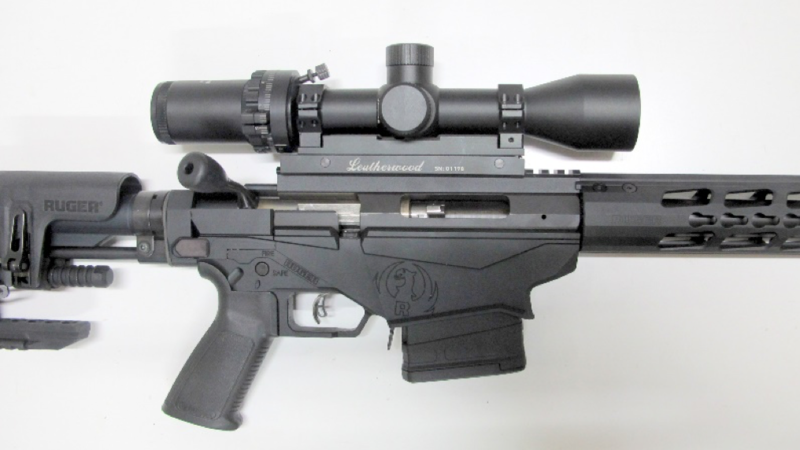 We used the respected long range rifle the Ruger Precision in .223 available from Reloaders. The Leatherwood scope system comes complete with a base that will fit onto any picatinny rail so it was quick and easy to mount the scope. This also means that it can be set up on any AR15 semi-auto platform! Looking through the scope, the picture was clear and the easy focus means that you can set the scope up for crystal clear views with your particular eyesight. 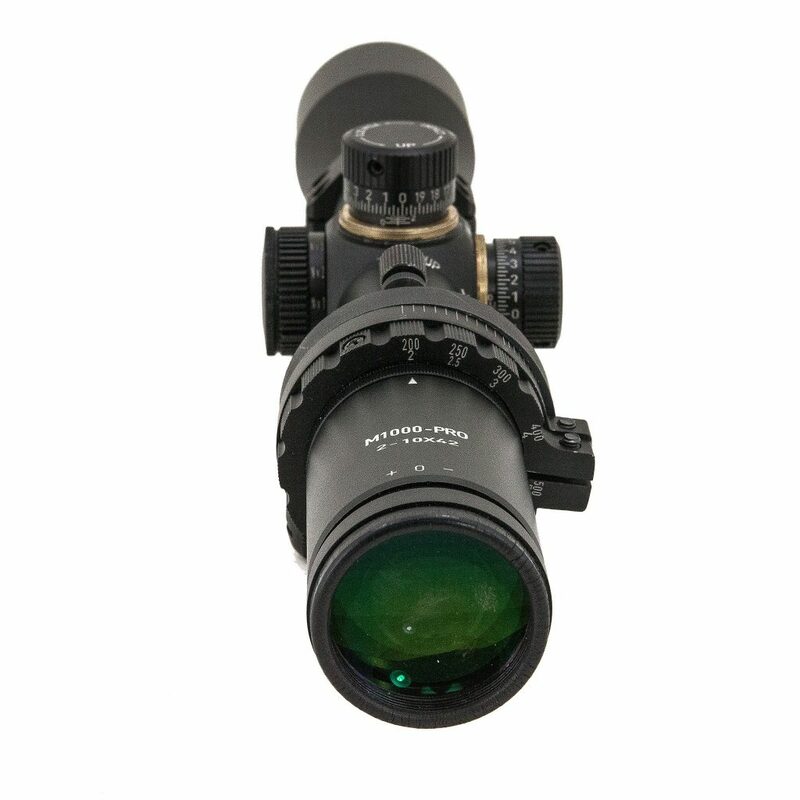 The scope has all the features you expect from high end scopes. The Ruger Precision was a joy to shoot and setting up the scope meant we used the 100m range and set the scope up with the 18 inch target bracket, then adjusted the power ring and zeroed the scope. The power ring and the cam ring are then locked together and bingo! The scope will automatically range the target and compensate for bullet trajectory for distances up to 1,000 meters. This means no holdover or guesswork. What this means in practical terms is that we can get a nice tight group from the Ruger precision at 100m, then when we took the target out to 300m and bracketed the scope in we hit the 6 inch diameter steel gong every time. Out beyond 300m it took some doing to bracket the target precisely in the centre of the thicker crosshairs to get an accurate reading and cam adjustment on the scope. Very doable, but it took some practice. However, the Leatherwood ART M1000 scope lives up to its claims. It gets you on target fast, with no calculations. 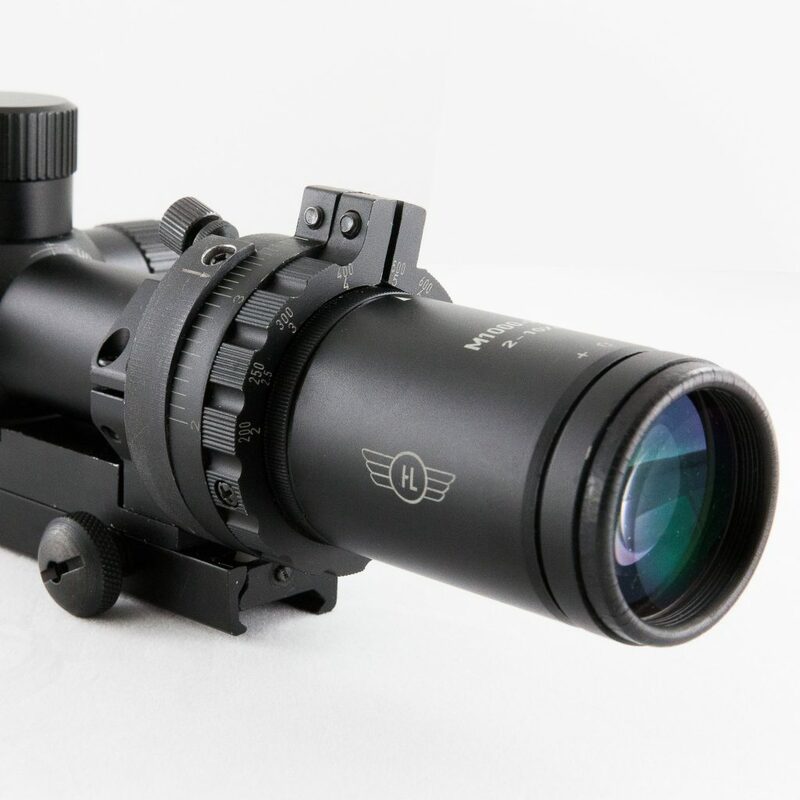 It is amazing, this scope can make any shooter effective at virtually any distance, and it is great for AR15 set ups! It excels at speed. The Leatherwood scope from reloaders quickly gives you centre-chest hits on deer-sized game and does so especially well at ranges from 250-500 yards. 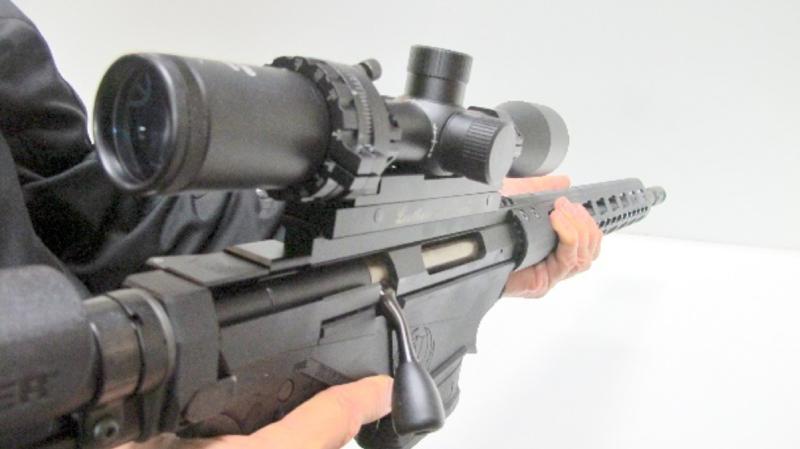 High end tactical scope users might poo-poo the ART M1000, saying it is not precision accuracy. They are missing the point. Whatever the ART1000 gives up in precision, it gains in speed and ease of use. In the bush, this Leatherwood system is battle proven and other high-end scopes may prove troublesome. For a practical hunters that need a scope that delivers a quick shot, then buy the Leatherwood ART1000. It gives you the ability to take that shot no matter the range when it presents itself.